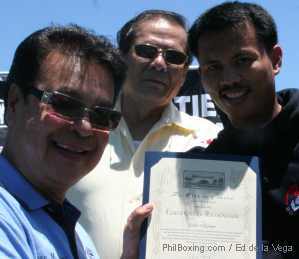 Carson City, CA -- May 24, 2006. right after the Press Conference held at the Home Depot Center in the City of Carson, California hyping the fight between Fernando Montiel and Jhonny Gonzalez, Carson City Council member Elito Santarina, the lone Filipino-American Council Member from that City, presented very handsome certificates to various Filipino boxing personalities recognizing them for their respective achievements. 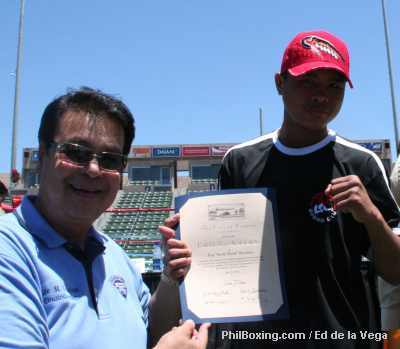 First to received a certificate was the new WBO Vice President for Asia Pacific, Leon Pononcillo. He is being recognized for his contribution to the success of boxing not only in the Philippines but the whole Asia Pacific as well. 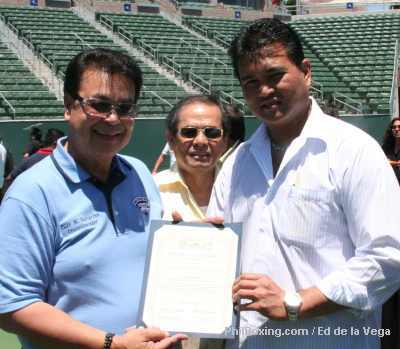 WBO Vice President Leon Panoncillo receives his award from Carson City member Elito Santarina. Edito ALA Villamor was also recognized for the skillful guidance he provided the young boxers from the Cebu-based ALA Boxing Gym, notably Rey Boom Boom Bautista, Z Gorres and Czar Amonzot. As the Chief Trainer of that now famous boxing gym, Villamor is responsible for the daily training regimen of all the youngsters from that gym particularly the three aforementioned fighters. He also travels with them to the US when they have matches to fulfill. Rey Boom Boom Bautista was honored to give credence to his undefeated record as a fighter, particularly the knock out victory he had at the Staples Center last Saturday against Chucky Bonilla of Nicaragua. Incidentally, Bautista is set to go home today (May 24th). He is booked on the Philippine Airlines Flight to Manila tonight. 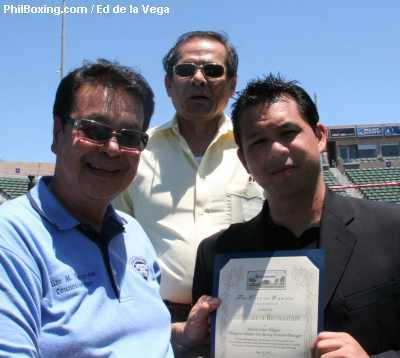 Rey "Boom Boom" Bautista receives his awards from Carson City member Elito Santarina. Michael Aldeguer receives the award on behalf of his father Antonio L. Aldeguer. Michael Aldeguer also received a certificate on behalf of his father, Antonio. The elder Aldeguer is being recognized for his contributions to the wide spread proliferation of the boxing profession in the Philippines, particularly in Cebu where he established a world-class gym to train prospective Filipino world champions.